I usually don't do posts like this, but I thought it fitting given, my fondness for movies and television shows of bygone days, to share some memories of two Hollywood greats. This past week, we lost two amazing talents. Both can be remembered for superb movie and television roles. They were masters of their craft....one with amazing improvisational and comedic abilities and, the other, a smoldering, dramatic, leading lady who just oozed "class". On a more personal level, I've always been a fan of them both and will always remember them for helping to make my life just that much brighter. It was 1978, I think, and you probably couldn't find a bigger fan of the show Happy Days than a little, blonde headed, ten year old me. If it was Tuesday at 8pm, you could bet our t.v. was tuned to ABC to watch Fonzie, Richie, Mr. and Mrs "C" and the whole gang bring back the 1950s in true, situational comedic, style. This particular episode featured an alien character....Mork from Ork....who wanted to take "humdrum" Richie back to Ork for further study. Of course, it was up to the Fonz to save Richie and that meant going toe to toe with Mork. In reality, it's said that it was more like Henry Winkler trying to keep a straight face while working with Robin Williams at his manic best. It was my first look at a young Williams and, to be sure, not my last. 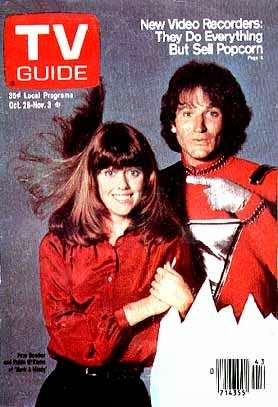 They gave the Mork from Ork character his own spinoff show....Mork and Mindy. I was totally on board and loved this one almost as much as Happy Days. The more I watched Williams work, the more I came to appreciate his rapid fire wit, sense of humor, and ability to tie it all together to make us laugh. It wasn't soon after that Williams started getting more and more movie roles. From Popeye...a film I didn't care for, but also believe that no one but Williams could have pulled off....to Good Morning Viet Nam to Hook to Aladdin to Good Will Hunting, Williams continued to impress me with his range as an actor. Robin Williams was one of those "one of a kind" type performers. Before he burst onto the scene you hadn't seen anyone like him and, now that he's gone, I'm certain you'll never see anyone like him again. Rest in Peace Mr. Williams and thank you for the laughs. 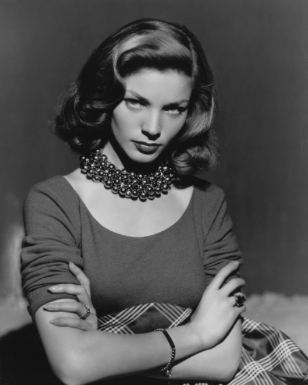 The other loss, in fact it happened just the day after Robin Williams' death, was that of Lauren Bacall. The first time I ever saw Bacall was in a commercial which I can't, for the life of me, remember the product. I do remember thinking how gorgeous she was, even though well into her late 50s/early 60s. This was a time before I started getting into old movies, so I hadn't yet grown to appreciate her for anything more than a pretty face. Then I saw, I think it was, Key Largo and that was it. I was a bit smitten. I could see how Bogie could fall for a dame like that. In her younger years she was downright beautiful. A gorgeous face, alluring eyes, and that voice....wow. Bogie ranks up there with Joe DiMaggio as far as "famous guys who married WAY up" go, in my book. I saw Bacall in many roles after Key Largo and was always impressed by her range of emotions and how she could just draw me into any film she did. She was smooth, cool, and always struck me as someone who was just in love with acting. She was a fashion icon and did everything with such flair. I also think, as she got older, she wasn't afraid to try new types of roles...even if they were on television. She did a two-parter on The Rockford Files and even ventured into animated work, voicing a character not only on a new Scooby Doo movie, but also on Family Guy. As the song said, she really did "have it all". Rest in peace Ms. Bacall, old Hollywood will be that much poorer for it's loss and you will be missed. 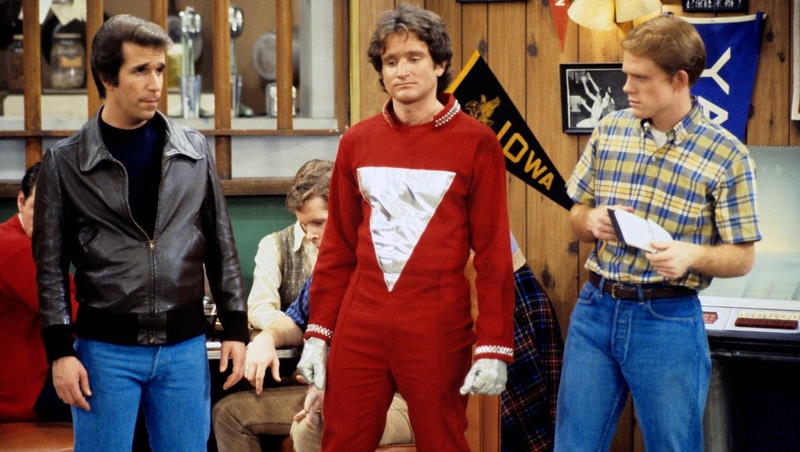 Mork was my first introduction to Williams and I never missed either of those shows. Forgot that Bacall did a voice on Family Guy. It is a sad week for talented people to leave... I still very down on the whole thing. As the stage for real talented people gets a little smaller. I never watched Mork but learned to appreciate Williams from his movie roles. I think my kids watch Jumanji a hundred times. He is the ultimate comedy-turned-dramatic actor. He did both with the same intensity and he was brilliant. Also sorry about Bacall although I don't know her as well. Happy trails indeed. But do you watch TV, now, sitting on your head? So sad about these deaths. I only know Robin Williams through entertainment and I want to rememember his work more than his passing. I grew up with Mork, and loved Dead Poets' Society and Jumanji. He wasn't just a great actor, but - from what I've read recently - an amazing man. So very sad. Great tribute to these fine, fine actors! It was fun walking down memory lane with you. Plus, I love that song by Bertie Higgins and it was really sweet hearing it again. My daughter called the day Lauren Bacall died and asked if I was in mourning because she was also one of my favorites. Then we got in this long conversation about the year Bogie died. I never looked it up so we were never sure. Yes, they were two of the "greats" of pictures. 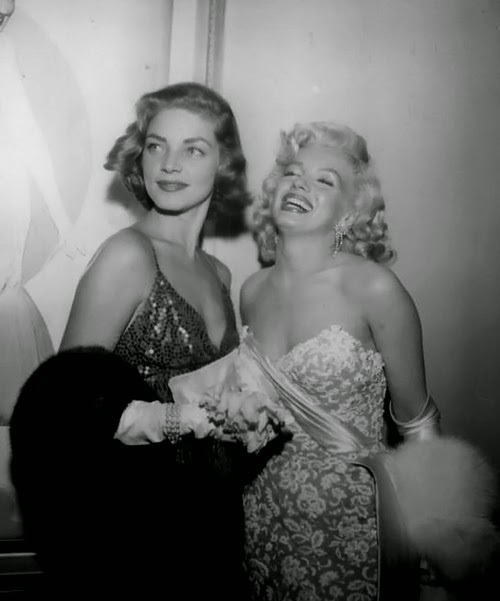 Hi Mark - one well-lived life who gave much pleasure to many ... Bacall was just a delight. Mork and Mindy was a stable of my childhood too. Both Robin and Lauren will be missed greatly. I was heartbroken to hear about Robin Williams. I went to several taping of Mork and Mindy and saw his live act. For me, he set the bar for funny.